By buying this product you can collect up to 58 points. Your cart will total 58 points that can be converted into a voucher of €0.58. The Joyetech eVic VTwo Mini is the updated version of the original eVic-VTC Mini. The Joye eVic VTwo Mini device with updated 4.02v firmware allows the device to activate up to 75 watts and updated temperature control modes. Variable temperature control. 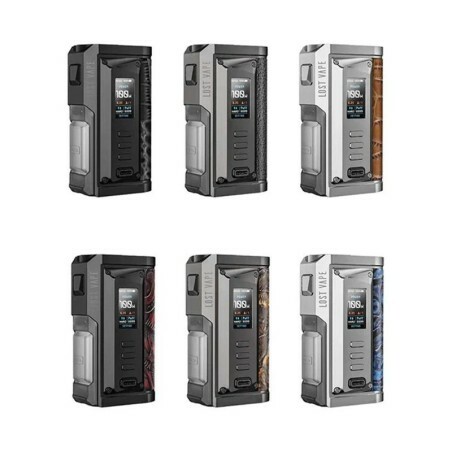 The CUBIS Pro atomizer adapts perfectly to the new mod eVic VTwo box, applying upgradeable firmware and dual battery protection. This supports the custom logo and the RTC (Real Time Clock) display with the watch screen protection. The filling of the liquid can easily be achieved by simply removing the top cap and injecting into the side holes. The innovative CUBIS Pro with leak-proof cup design allows you to enjoy the best vape experience of all time. 1 head NotchCoilTM 0.25ohm DL. 1 BF SS316 head 0.5ohm DL. 1. EVIC Vtwo Mini is designed for beginners and experts. 2. An OLED screen that can clearly read all the information. 3. While the RTC mode shows the time, the custom logo mode will allow you to customize your box. 4. EVIC VTwo Mini applies two sets of battery protection circuit system, realizing overall battery protection over charging. 5. EVIC VTwo Mini is equipped with upgradeable firmware. 6. CUBIS Pro is compatible with the BF atomizer head. 8. New CUBIS LVC (Valve Control Liquid) head applies to the liquid valve control system. Simply turn the ring on the base to adjust the valve. Practice for the high rate of vegetable glycerine. We can load EVIC Vtwo Mini via USB cable that can connect to a computer or a wall adapter.